This week is my first official week of half marathon training. The plan is 4 miles three days a week, a long run on the weekends, and some core training and intense stretching on the off days. It's basically the unofficial plan I followed that led to my half PR, and I like having the freedom to treat those 4-milers as recovery/tempo/speedwork as needed. I want to keep myself from getting burned out; I want to enjoy this training cycle and feel strong at my race. Which race? Why, this one these three of course! I posted a couple weeks ago that I wanted to do this challenge. My Hanukkah gift from my parents was the opportunity to do so. Race entries are amazing gifts for the runner in your life! Anyway, the half is in January and it will be my last big race before Ragnar. I have about 7 weeks to train, and given that I'm not starting from scratch, I'm feeling confident in my ability to be smart and effective this time around. 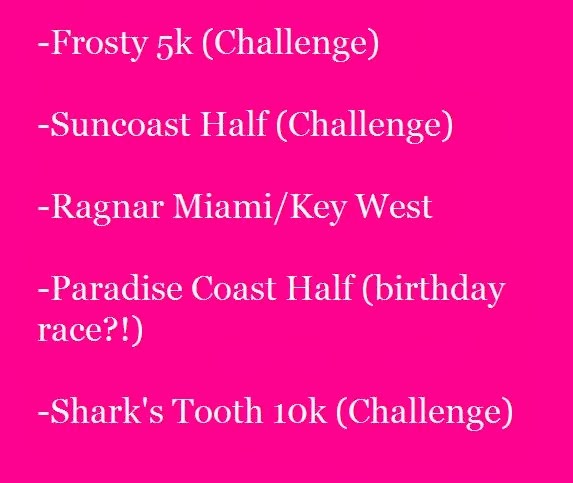 My only concern is the Paradise Coast Half, which is literally two weeks after Ragnar. But it falls on the Sunday after my birthday and is super close to us; I feel like it'd be a great way to celebrate my birthday! Also on my radar is New Years. I have only ever kept resolutions when I thought about them well ahead of time, planned them out, and related them to running. That's how this whole "hobby" of mine even got started! I'm playing with a few key goals this year; I'm trying to keep it simpler than last year. Not that this year's resolutions weren't successful...but my goals for next year are going to take a considerable amount of commitment, and I think the simpler I keep them, the more likely I'll be to succeed. But that's another post altogether! What does the rest of your race season look like? What is your favorite distance right now? 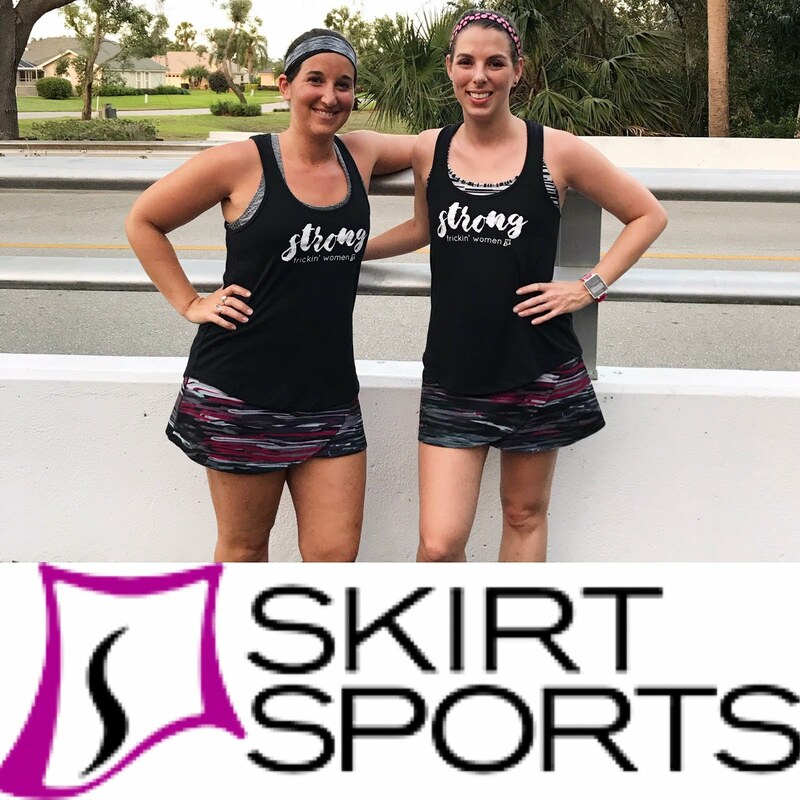 I'm rediscovering my love of the 5k, but I'm excited to train for some longer races! Have you begun to think ahead to 2014? Have you ever kept a New Years resolution? What are your Ragnar legs like? I'm SO excited to read about your experience with that race... This is making me want to plan a race season for myself. Good luck!!! I think my legs are 2.7, 7 and change, and 4ish. (The middle one got changed a little so I'm not sure what it is now.) I'm so excited to do it, but also super nervous!! I just hope it's cool out during my mid-day leg. I am so jealous of your race line up! What a great present from your parents! I actually just asked my boyfriend yesterday if he would buy me a race entry for my birthday. The best kind of present! I've never received race entries for a gift before...it seriously makes me SO happy!! Such a great gift that I'll remember forever! I would love to do a Ragnar some day. They look incredibly fun! Aah, everytime you mention Boston I get so excited for you! And training starts so soon for you!!! I'm not sure what counts as the end of the season for me...summertime? How exciting that you have FIVE races coming up! I've been thinking about scheduling in a couple of 5Ks or 10Ks soon-ish but I can't seem to pull the trigger. I'm learning that I'm not a big fan of organized races. I like doing my own thing a lot. What is it about organized races that you don't like? It's interesting because so many runners live for the camaraderie and atmosphere of the races! I think the more you race, the more used to it you get and the more you like it :o) We should totally try to run one together! When I first started running I really liked organized races. I was constantly on the search for a new 5K to do. Then one day during half marathon training I started thinking about what I like most about running and it's really those moments where I'm alone and cruising. I must be really anti-social deep down :) I definitely want to meet up at a race with you though! Good luck with training! Your season sounds so fun!! I love that you're racing though the winter! I always do a half-marathon at the end of Feb and it keeps me focused all winter. Good luck with all you have coming up. Such an exciting schedule!! Winter is prime racing time for me! I don't know how people race in spring/summer/early fall! Races are a great motivation to stay on the right track! And they are awesome gifts! MY mother-in-law once gifted me The Mile as a gift hehe. I'm going to have to look into what "the Mile" is! This is my first time getting race entry for a gift, and I love it!